The McGarel Town Hall clock tower. 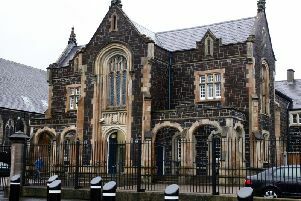 A civic-minded Ballygally resident is seeking the support of local people in a bid to spruce up Larne town centre. Andy King is the founder of The Larne Renovation Generation social media page, which was created in order to promote and revitalise the Larne area’s built heritage. The page provides a forum for the public to discuss what they would like to see happen in the town. Andy told the Times: “Larne Regeneration Generation is a wee group to stop the stigma which Larne faces from people outside the town. “I want to start a fight back to improve Larne and get the general public to improve it, instead of waiting for the council. Andy’s latest venture involves gathering local people together in a bid to come up with inventive ways of breathing new life into the town centre. “I had the idea of getting a group of like-minded people together some Sunday for a walk around the town centre with clipboards and pens to do a bit of collective brainstorming,” he added. Andy’s social media campaign has already garnered some support, with one eager person posting on Facebook: “I think its the only way to get things done and that’s being by proactive. Anyone else who is interested in getting involved in Andy’s regeneration initiative can contact him through the Larne Renovation Generation Facebook page.